Elaine P. Draeger is the President and Chief Executive Officer of Sheltering Arms Early Education and Family Centers, a nonprofit organization offering dedicated early childhood educational services. With a wealth of knowledge and experience in people management, Ms. Draeger focuses on answering to the 33 members of the board of directors, overseeing daily operations, including 17 centers, 4,000 children, and 650 staff members, and handling funding streams. She also ensures reporting guidelines and timelines are met, attends regional and national meetings, and trains, mentors and coaches others, while working within a budget of $25.5 million. Ms. Draeger makes informed decisions regarding programs and curriculum, writes grant proposals to endorse quality care for children, and explores ways to benchmark performance. 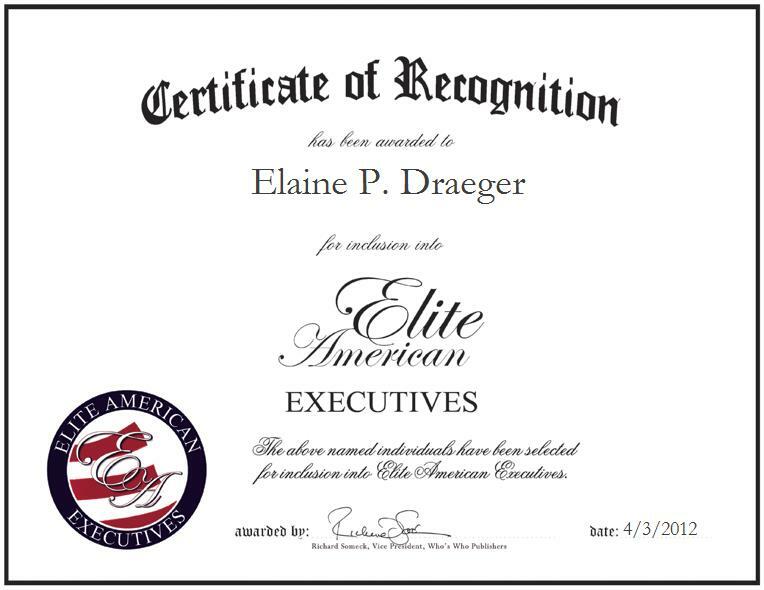 Over the course of a successful career that has spanned more than two decades, Ms. Draeger has garnered a reputation of distinction and prominence for her business savvy, persistence, ethics, and motivation for surrounding herself with like-minded and encouraging individuals. She received the 2005 Georgia Association for Young Children Jo Cato Perseverance for Children Award, and she was also named One of Georgia’s 100 Most Powerful and Influential Women by Women Looking Ahead Magazine. With a relentless commitment to remaining abreast of trends and developments in nonprofit administration and education, Ms. Draeger has completed coursework in nonprofit administration at the Goizueta Business School at Emory University, coursework in early childhood education at The University of Tennessee at Chattanooga, and coursework in elementary education at Newberry College. She is also a member of the advisory board of the Georgia Department of Early Care and Learning, the Georgia Partnership for Excellence in Education, and Smart Start Georgia, and a member of the National Association of Young Children, and Kiwanis International. Ms. Draeger was inspired to follow her dreams of pursuing a career in education by her long-standing interest in teaching, and by the insight she gained from her parents, who were educators. She built on an impressive professional skill set throughout the past 40 years, and she continues to strive for excellence in her every endeavor. Sheltering Arms is Georgia’s oldest nonprofit early childhood education programs, and one of its most respected. The organization’s mission is to serve working families with high quality, affordable child care and education and comprehensive support services, as well as to provide professional development for early childhood educators and community outreach. The Sheltering Arms curriculum is based on a philosophy of early childhood education: High quality early childhood education meets the total needs of the individual child.